"Relief siliconed mats for baking. 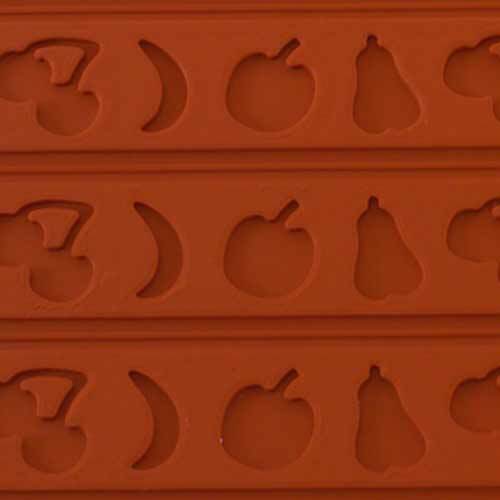 Ideal for the creation of beautiful designs applyable on the sides of your cakes and dessert. Spread the cigarette dought on the mat and put it in the freezer for 5 min. Than spread the biscuit dought upon the cigarette dought and put it in the oven at 430F for abuot 10-12 mins. Than place the mat upside down on some greaseproof paper and remove the silicone mat gently. Cut the biscuit in stripes and put them in the mold following the border and you’ll have your wonderful decorated side of your cake. Then keep on filling the mold with your favourite ingredients and you’ll have your dessert! Size 23.62"" x 15.74"""